Southwest Indian Foundation sponsored the "Ribbon Cutting Ceremony" to dedicate our 200th home built on the Navajo Indian Reservation. We celebrated this milestone with our partners, the Innovative Readiness Training mission "Operation Footprint" that provides housing for local Navajo families in need. The Southwest Indian Foundation, the IRT leadership along with the Air National Guard and other members of the military including the Veterans Administration, Navajo Housing Authority as well as other local agencies came together for the ceremony. Since 1997 the Southwest Indian Foundation has been proud to take the lead in hosting "Operation Footprint" which provides homes for families who would otherwise have no other way to have a roof over their heads. Our building partnership provides support to build and supply homes to the less fortunate Navajo families throughout the Gallup region. Other aspects of this mission is to provide waterlines, upgrades, reconstruction and to increase the quality of life in our communities. The training we receive here is irreplaceable, said Senior Airman Brian Saucier, a structural apprentice of the 101st Civil Engineering Squadron, Maine ANG. More important, it really feels good to see how people live here and see that what we can offer them can improve their lives. "Today is about honoring this land, this home and this family. 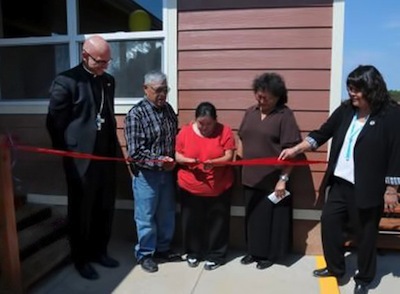 It is to celebrate that they will be allowed the opportunity to grow to see their grandchildren reach new heights," said Roberta Roberts, the public relations director for the Navajo Housing Authority. Following the ceremony, Vera Vecenti-Hoskie and Jimmy Hoskie along with their daughter Regina and extended family walked through the newly constructed home that was given to them free of charge through Operation Footprint. "We were very cold and freezing but now we have much better living conditions!" said Vera. Vecenti-Hoskie and Hoskie said they were excited to have a stove, refrigerator and appliances but their favorite part about the house was that they would now have running water! The Hoskie family went on to say that they believe their prayers were answered and are so humbled by this experience. They wanted to thank the Southwest Indian Foundation and it's staff, all branches of the military that participated in Operation Footprint and everyone that was involved in building their new home. We are honored and humbled to have such great partners in this worthwhile endeavor. "All of my days, I could see the outside world with their modern home and modern facilities." said Vecenti-Hoskie. "I prayed that my family would have that someday... and boy, that prayer was answered today."